Photography website templates to add life to your photographs. 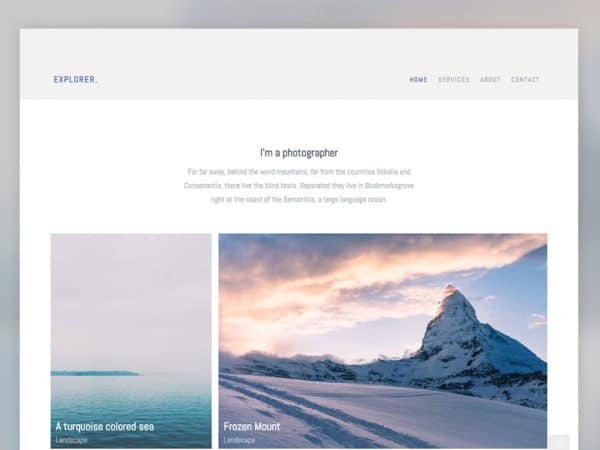 For taking a perfect snap a photographer spend several hours, our website templates will help you showcase such difficult shots elegantly to the users. Don’t just showcase your photographs, let our photography website templates tell inspiring stories with your photographs. With the help of latest image sliders and new effects, we are able to add life to your photographs and let the user relive the moment. Simple layouts will give a distraction-free environment for your users to enjoy your photographs. Whether photography is a hobby or profession, these website templates will help you share your works elegantly. Promotional elements are given for professional photographers to promote their service and get new projects. If you are a beginner or expert in photography, you need a photography website to make a brand, improve your reach, offer awesome services and even sell the best shots….